BelarusDigest > All > Belarus and China in the Love Triangle: Who is the Third Party? Recently, Belarus was frequented by Chinese matchmakers. To have a look at the bride with his own eyes, last month the president of Belarus went on a date with his new beloved in her own territory. In the middle of October, Alyaksandr Lukashenka paid a visit to the People's Republic of China. Behaving as proper fiancé, Belarus' leader announced that he has observed China for a long time and admired the scale and the uniqueness of its projects which demonstrate Chinese dynamism to the rest of the world. Belarusians, according to Lukashenka, rejoice in Chinese successes and celebrate them as their own. If Belarusian leader really has been observing China for years, why has the need for China in Belarus appeared just now? Was it the Belarusian leader who suddently realized the he needed China or was it China that realized it missed Belarus a lot? Actually, as in every chic love affair, there is a third party involved — it is the behavior of Western donors that has provoked Belarusian-Chinese love affair. Looking too far eastward, we have forgotten the Western donors, who have been providing Belarus with development aid for years. Giving very modest assistance and imposing sanctions, the West pushed Belarus to change its borrowing preferences in favor of China. The main western donor — the third party in this love affair — is the World Bank, which is represented by the International Bank of Reconstruction and Development (IBRD) in Belarus. Shortly after the country proclaimed independence the IBDR has been providing the country with constant, though varying in intensity and volume, assistance. However, this Belarusian bride-to-be, which put herself back on the map on the eve of the latest presidential elections, appeared to be not as caring as the Chinese competitor. Speaking the language of numbers, Chinese export agencies in Belarus promised a credit line of $15 billion on the eve of the presidential elections in 2010. Chinese export credit agencies debuted on the Belarusian scene relatively recently — in 2009. China inspires other countries not because of Maoism or colonialism, but largely because of policies developed by the US and Western Europe. Export credit agencies are neither new institutions nor were they invented in China. Actually, the first export credit agency was created in order to deal with the post-revolution Russia back in 1919, when the political climate was full of risks. In order to maintain exports to Russia the British firms started up export credit agencies. Since then export credit agencies have been established in almost all high- and middle-income countries. One could argue that comparing China's loans and IBRD assistance is like comparing apples to bicycles. However, this is not the case. Official Development Assistance (ODA), like that provided by the IBRD, consists of loans, grants and/or technical assistance on concessional financial terms. This aid aims to reduce poverty and promote economic development in developing countries. Officially, lending through export credit agencies — with the pure purpose of export promotion — is excluded. However, the “purity” of export promotion can be difficult to measure. For instance, developed countries which belong to the OECD are constantly criticized of subsidizing its export credits with the ODA. Therefore, China's behaviour does not differ greatly from the one of developed countries. However, unlike the OECD, Bejing calls things by their true name. Thus not only developed countries offer export loans. Emerging economies are becoming new active actors in this market. For instance, China increased its exports of capital three times during the period of 2000-2005. The trend of the last decade suggests that some emerging countries became important suppliers of official export loans. This is why export loans fall under the definition of development assistance in the Belarusian case. Mainly due to a relatively large amount of Chinese export loans, the Development Assistance Committee’s (DAC) bilateral donors and partners are excluded from the recent love affair. In 2005-2009, Germany, Sweden, and the USA were the largest bilateral Western donors in Belarus, with the total amount of assistance of $85 million, $145 million, and $62 million respectively. Another institution, the European Bank of Reconstruction and Development (EBRD), is not involved in the love story either. The EBRD only offers symbolic funding to Belarus. However, just before the last presidential elections Belarus got additional $50 million from EBRD and the largest grant/loan from the IBRD in the whole history of cooperation for $255.6 million. This state of affairs proves the “bandwagon” effect in aid allocation: when a recipient receives more aid from one donor this may attract more funds from other donors. However, the amount of Western development aid is still incomparably low compared to Chinese export loan proposals. The IBRD’s loans and grants introduce less visible changes in the country than Chinese export credits. Thus, a paradox lies in the fact that selfishness of bilateral ambitions of China as a donor positively affects development of Belarus. Whereas, "fairness" of the Western assistance seems to push off the development. The situation around China’s and the IBRD’s assistance looks like a downward spiral or a vicious circle of aid. Until Belarus gets on the path of democratization, it should not expect increase in aid from the Western donors. At the same time in theory the more aid country gets, the more aid is on offer and vice versa. Unable to get money from the West, Belarus begins to cooperate with Chinese donors which do not pay any attention to the regime type, and the regime is getting stronger because of Beijing’s funds. Since Western donors do not look like they are mobilizing themselves to provide Belarus with more development aid, for now, we should expect the Belarusian-Chinese love relationship to flourish. Belarusian authorities intensified their efforts to please their Russian counterparts by publicly praising the idea of the Russia-dominated Eurasian Union. They also continued repression of political opponents. Several opposition activists involved in actions of solidarity with political prisoners were arrested last week. Two journalists working for popular Poland- and Russia-based media were also targeted. 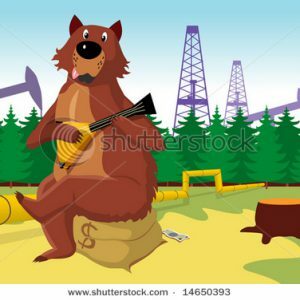 Lukashenka: Belarus Stability Depends on the "Russian Bear". President of Belarus Alexander Lukashenka believes that the stability of Belarus is largely dependent on stability in Russia. He said on October 26 "If the Russian bear is doing well, we'll be fine, too. But if Russia is shaking and unstable, as it did at the end of the last century, hard times will come for us". Makei: Eurasian Union to be in Real Competition with the EU. Head of Presidential Administration of Belarus Uladzimir Makei said that the idea of Eurasian Union, voiced by Russian Prime Minister Vladimir Putin and supported by Alexander Lukashenko, was taken by West very cautiously. According to Vladimir Makei, Western countries fear the Eurasian Union to become a real competitor in foreign markets. Lukashenka: Belarus has learned to combat «revolutions through social networks». Belarus has learned to combat "revolutions through social networks," Alyaksandr Lukashenka said while meeting on October 26 in Minsk with members of the Council of the Parliamentary Assembly of the Collective Security Treaty Organization (CSTO). Russian journalist deported from Belarus. On October 26, Igor Karmazin, reporter of the Moskovsky Komsomolets Russian newspaper, was deported from Belarus after arranging a number of interviews with former Belarusian political prisoners and their families. Karmazin was given a paper saying his entrance to Belarus would be banned within a year. Belsat journalist warned by General Prosecutor's Office. On October 27, independent journalist Alina Radachynskaya was accused of cooperation with the foreign media, in particular, of working for the Polish TV-channel Belsat without accreditation. Two more Belsat journalists – Alyaksandr Barazenka and Aleh Razhkou – were summoned to the General Prosecutor’s Office but no warning was issued to them. Actions of solidarity. From October 21 to October 29, the civil campaign “European Belarus” held daily pickets to demand freedom for the political prisoners. At least 1.5 dozen people were detained during the actions of solidarity in Minsk. Some of them were sentenced from 5 to 15 days of administrative arrest under for "violation of the order of organization or holding mass actions or picketing". Gomel Court sentenced local activist Vital Pratasevich to 10 days of administrative arrest for staging an unauthorized picket of solidarity in Gomel. Opposition activists detained. On October 27, Gomel Savetski District Court sentenced local activist Illia Mironau to 10 days of administrative arrest for involvement organizing the People’s Assembly scheduled for November 12. On October 27, Barysau district court sentenced a former prisoner of conscience Aliaksandr Malchanau to 10 days of administrative arrest for allegedly resisting arrest. On October 30, a former Head of the "Right Alliance" Yury Karetnikau was detained in Minsk. He was charged with disorderly conduct. Total number of political prisoners – 11+3. Now in prisons there are not less than eleven political prisoners: ex-presidential candidates Andrey Sannikov, Nikolay Statkevich; leader of the campaign “European Belarus” Dmitry Bondarenko; Paval Seviarynets; Head of the Human Rights Centre “Viasna” Ales Byalyatsky; youth leaders Zmitser Dashkevich and Eduard Lobov; entrepreneur Nikholay Autukhovich. Anarchists Igor Olinevich, Nikholay Dedok and Alexander Frantskevich are recognized as political prisoners of the Belarusian regime by human rights organizations Viasna and BHC. Three more anarchists from Babrujsk including Yauhen Vaskovich, Pavel Syramalotau and Artiom Prakapenka are under discussion.